Specialty tubing, low temp, solvent resistant, heat resistant, flame resistant, adhesive-lined tubing, heavy /medium / standard & wall tubing, non-shrinkable tubing, fluoro plastic tubing. The Tyco Electronics Raychem brand of heat shrinkable polymer products is recognized worldwide. It is backed by a history of proven performance, reaiability, innovation and superior quality. 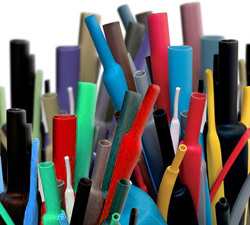 Tyco Electronics manufactures to the world largest range of heat shrinkable tubing. Tubing that provides cable protection offering exceptional insulation, mechanical protection, and strain relief. Tyco Electronics are the recognized world leader in heat shrinkable polymer technology.